The Fifth Annual Dance Big Red student-led dance fundraising event at Western Kentucky University will be held March 29, 2019. This past March, nearly 800 students danced for 12 hours and raised over $73,000 for Norton Children's Hospital. 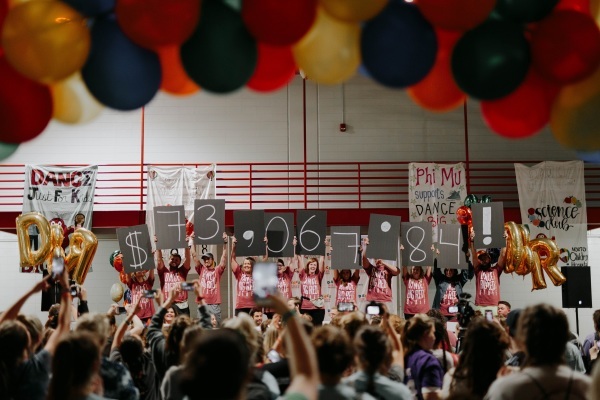 The overall goal for Dance Big Red 2019 is to raise $85,000 and recruit 1,000 dancers. All Western Kentucky University students, faculty and staff are invited to participate as a DANCER. All WKU friends and family can support the event with a donation and/or become a business sponsor the event! All friends and family of WKU & Norton Children's Hospital are invited to visit DBR in person and encourage dancers to keep fundraising! Norton Children's Hospital cares for children from birth to adulthood with over 180,000 cared for in 2017 from across the state of Kentucky and Southern Indiana. Children require smaller equipment, different medications and sometimes, different doctors. Norton Children's Hospital clinical staff is trained to provide the special kind of care children need and deserve. Norton Children's Hospital is not-for-profit and relies on the generosity of the community to support programs, hospital improvements, education and advocacy through the Children's Hospital Foundation. Norton Children's Hospital cares for children regardless of their families' ability to pay. As the number of children needing help at Norton Children's Hospital continues to increase, so does the need to stay up-to-date on medical advances and technologies. The Fifth Annual Dance Big Red will support both pediatric heart and adolescent cancer care at Norton Children's Hospital. An Inspiring night - DBR 2018!